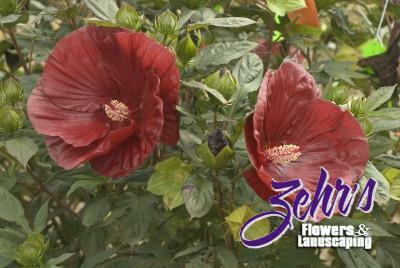 Dark cranberry red flowers are backed by deep glossy green foliage with slight purple overtones. The younger leaves are lance shaped while the mature leaves become dissected. The buds are near black in color. The plant habit is compact. Blooms from midsummer to early fall. Bred at Walters Gardens, Inc. and now part of the Proven Winners perennial program.